Today was the warmest day we’ve had this year (7°C, 44F). I saw quite a number of people walking around in tee shirts. I took a nice long windy walk and was sweating profusely. How goes the weather wherever you are? I am still trying to clear my backlogged posts…oops! I baked this cake last year and we really enjoyed eating it. It’s very moist and pleasant to the palate. One of the best chocolate cakes I’ve tasted in years. 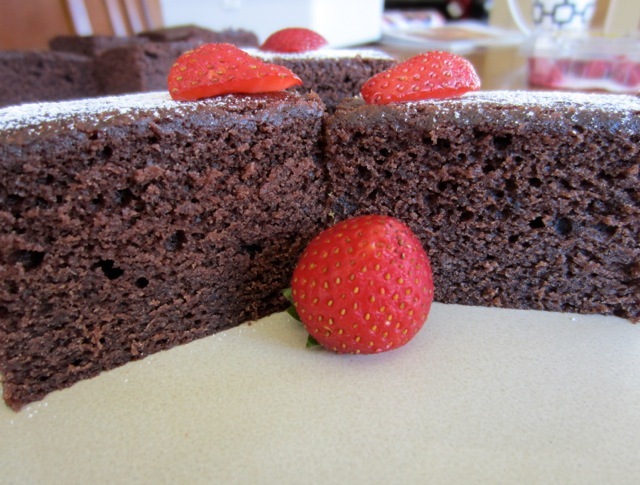 I used Dutch process cocoa powder for this recipe because it gives the cake a much darker colour. 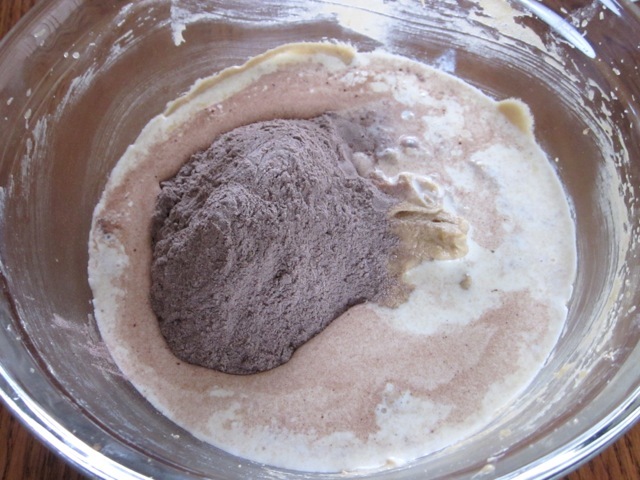 Please note that Dutch cocoa can only be used in recipes that call for baking powder as a raising agent because it has a pH of 7 or 8 as opposed to the natural cocoa powder, which is slightly acidic (pH 5.5). 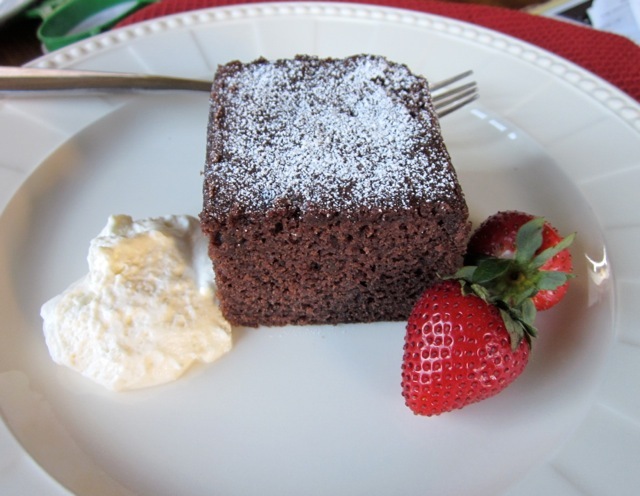 The cake can be served for tea but it can also be served for dessert with some whipped fresh cream, custard or ice cream. 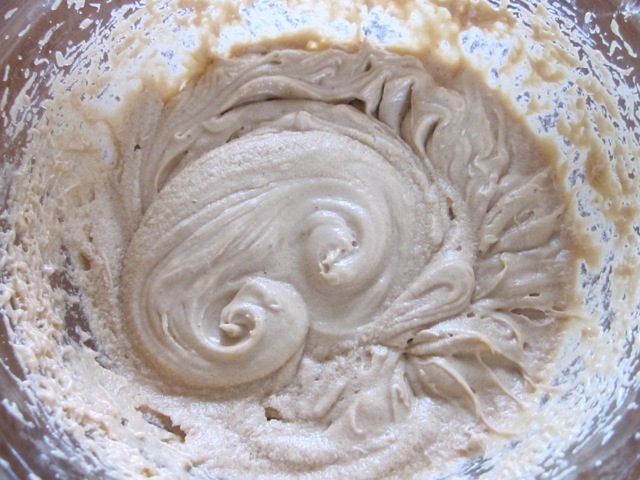 I wish you a happy baking and tasting. Preheat the oven to 325°F (160°C). 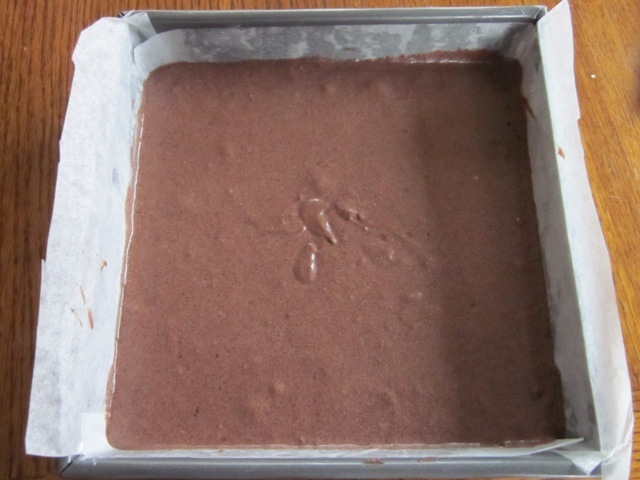 Grease and line 9 inch (23cm) square slab pan with parchment (greaseproof paper). 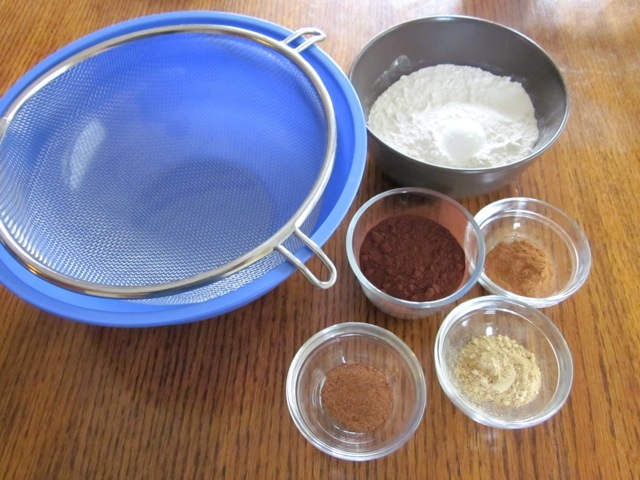 Sift the flour, cocoa, cinnamon, ginger and nutmeg. Set aside. until light and flurry. Beat in eggs, one at a time, beat until combined. 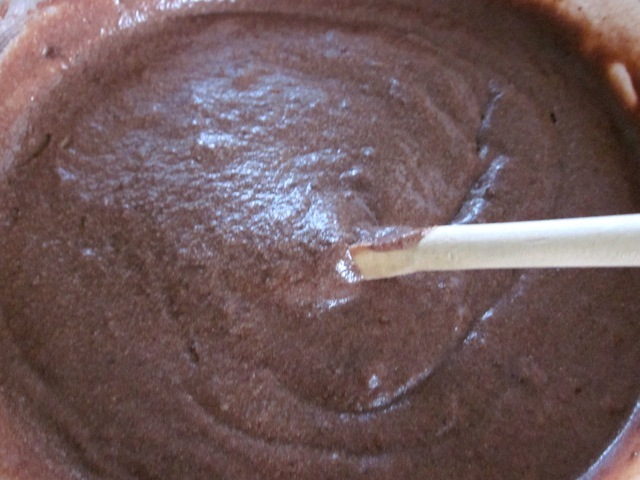 Spoon mixture into prepared pan, baked for about 1-1¼ hours or until firm. 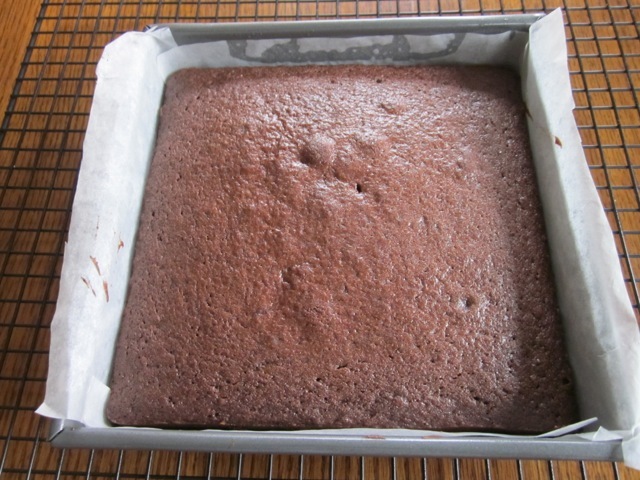 I baked the cake at 325°F (160°C) for 55 minutes. 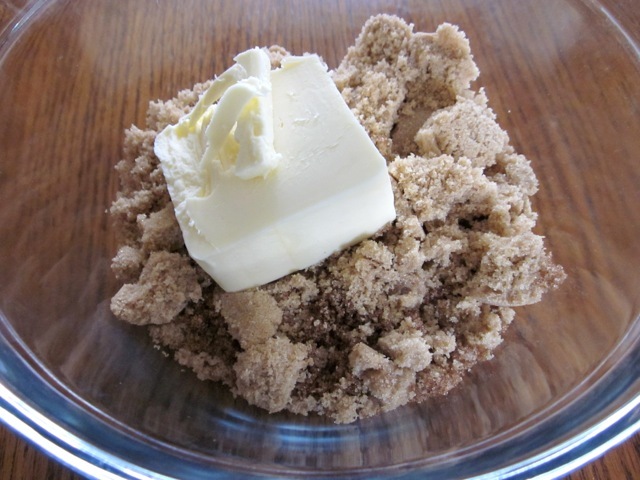 Beat butter and sugar in a bowl with an electric mixer until light and flurry. Beat in eggs, one at a time, beat until combined. Please note that oven temperatures are given as a guideline only. You may need to add or reduce the suggested temperature depending on your oven. I baked the cake at 325°F (160°C) for 55 minutes. I always weigh ingredients, especially the flour and butter. You can use cup measures, but please note if you scoop flour directly from the bag you will end up with 150-185 g of flour instead of the recommended 125g. I suggest you spoon the flour into the cup, heaping it up over the top, then slide a knife across the top to level off the extra. Be careful not to shake or tap the cup to settle down the flour or you will have more than you need. 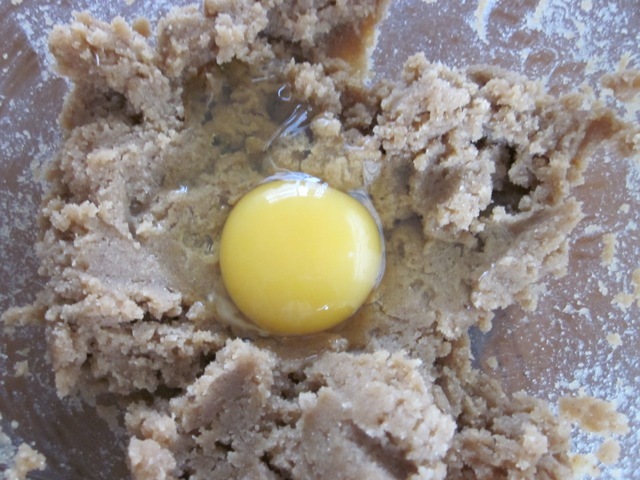 You can also sift the flour first then scoop. My best advice: please use a weighing scale. Made this cake last night (was going to make the apple & cinnamon recipe but didn’t have any sour cream!) and it is a huge success. Very moist, loved the spices (though I may try it with mixed spice rather than ginger next time I make it) and it tastes even better the day after. Think it would make an excellent pudding too. Definitely one I will be making again. I am so glad you made the cake and even more glad that it was a huge success for you. I totally agree with you. There are some cakes that usually taste better the day after. I don’t know why. I experienced the same thing with this and many other cakes. I am so happy that I inspired you to bake. I wish you a fantastic week. Best wishes! I love chocolate too. Thanks for the compliments. Enjoy the weekend! It looks so delicious. I hope that spring breeze warm you soon. It’s getting warmer and warmer in Seoul. Oh how I envy you. Sunny is better than cloudy. That sounds like my little town here…people wear flip flops and anything you can think of to the mall, movies etc. I stopped worrying about style. Have a great weekend. What a moist-looking cake. The spices must be lovely with the cocoa, Liz, particularly the ginger! Delicious. this cake is fabulous. Perhaps next time i can add cardamon? You’ve inspired me. Pleasant weekend! 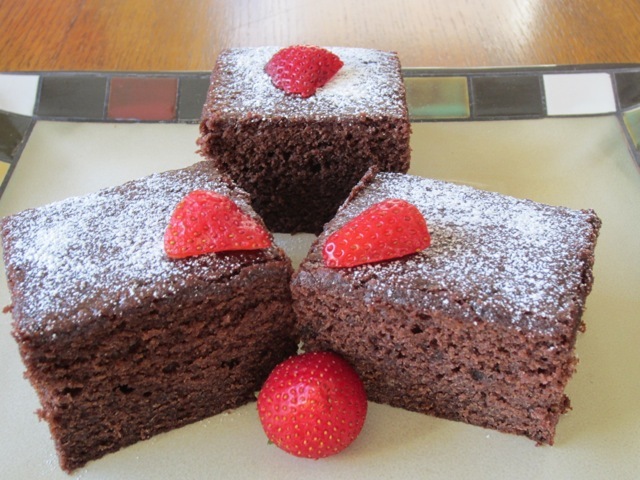 Your cake is not just I moist and pleasant to the palate, is even beautiful to admire! Thank you so much for the compliments. I wish you a pleasant weekend! Oh, i can imagine myself eating a slice, with a big glass of iced lime tea! Iced lime tea, how interesting. I wish I could mail you a slice. Have a lovely weekend! I am so glad to hear you had rain and it cooled everything. I know exactly what you mean…rain after a long drought is a great blessing. I hope it continues to rain, as usual. Enjoy what remains of your weekend! You certainly know how to tempt us . Ha ha I’ve missed the Simpson’s, sometimes life gets so busy. Simpson drooling is sure something. Have a great weekend! It’s absolutely divined, thank you. Thanks so much for the compliments. Fantastic weekend to you! This looks perfect. 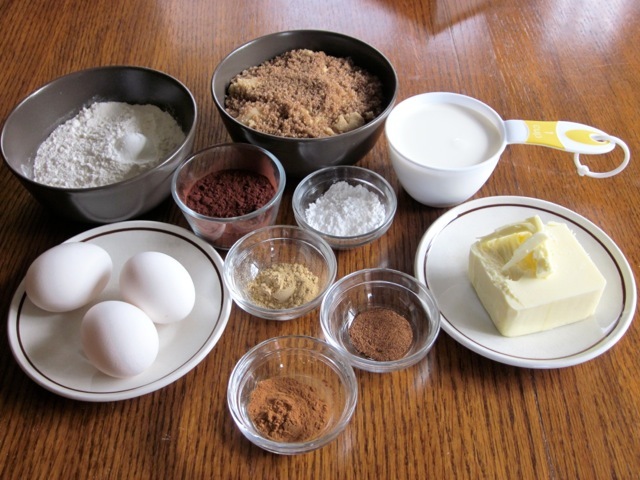 I love chocolate cake with cinnamon and other spices. Something about the simplicity makes my mouth water. Fresh whipped cream and I am good to go! Thank you. Simply the best…do you remember that song? I have eaten so much fresh whipped cream in the last week…I’m horrified…have a lovely weekend! I love whipped cream. It’s so luscious and addictive!!! Have a great Saturday! I have had some whipped cream in my fridge, every single day this week. Next week I’ll take a break. I hope you’ve enjoyed your weekend! Gorgeous cake!! 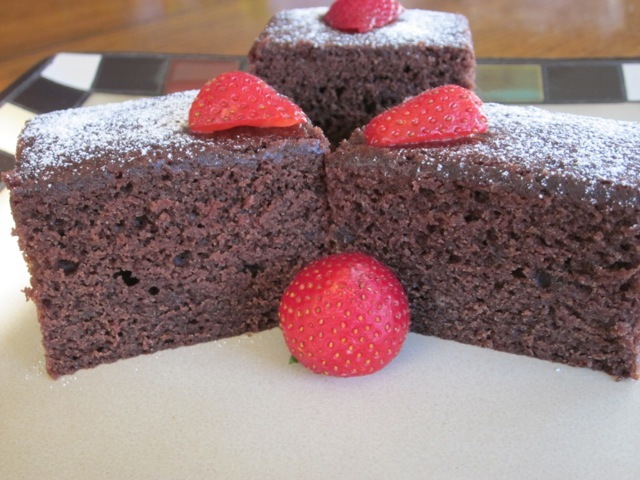 I love the combination of spices with the chocolate… A perfect cake for a day like we are about to have today! I’m in Niagara Falls, NY… And we are preparing for a blizzard today. We went from 50F yesterday with the temperature dropping to zero… High winds and expecting up to 18″ of snow!! 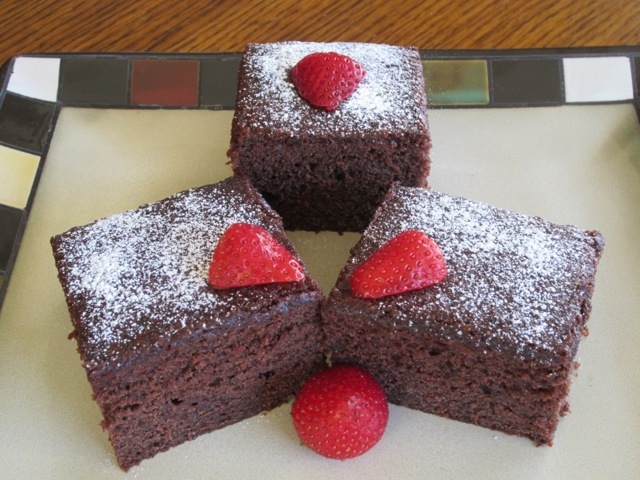 I just might bake this cake today… For comfort.. For warmth from the oven… For a special treat to try to get over these winter doldrums!! Thanks for complimenting. I hope you survived the blizzard. We did. The roads were terrible. I just stayed indoors the whole day. I wish you a happy baking if you decide to bake the cake. I have certainly treated myself to so many goodies but I have added pounds…have a great weekend. Omg 20 inches of snow is something. We probably had 15 inches It was heavy and lumpy too. Oh boy I hope this is the last bout this year. Have a pleasant weekend! Good morning Ralph (it’s actually 22.28 right now.Did you receive my mailbag? Have a great weekend! Spicy ? Really? It looks so sweet. Spicy yes, but sweet. Best wishes! My cousin is a real chocolate fan, if I show her this recipe we are probably going to be making it! Adding the spices is something I would not think to do with a chocolate cake! Excellent idea Liz! I’m glad to hear the weather is getting better. I do sometimes feel guilt at escaping it this winter, but only for a moment. Grin….our temperature here remains about a steady 27 C. Tomorrow we are going back to Hilo to the Farmers Market. I just love looking at all the different fruits and vegetable and flowers and other ‘stuff’! I love how warm and inviting your food photos are! I can almost smell the heavenly scent….happy Wednesday Liz! Oh how I love markets with fresh veggies, fruits and flowers and people dressed in a wide array of colours. I truly admire your your escape…27 C wow not too hot, not too cold, just right. 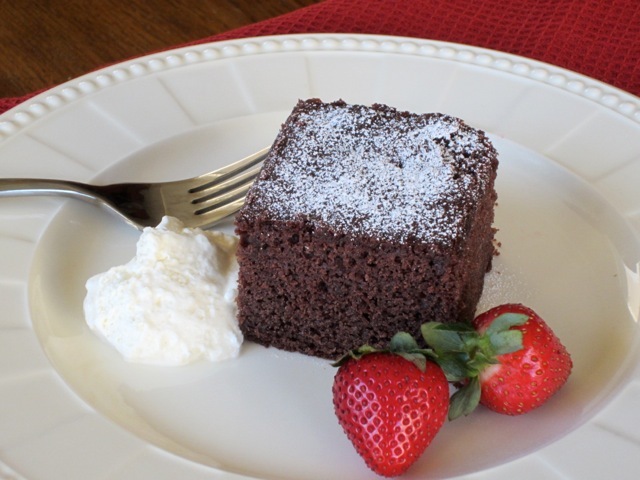 The chocolate cake tasted absolutely delicious. We gobbled it all up in hours. I am frantically trying to post my backlogs. I don’t seem to be making much progress. The list is long…and the check off is snail pace slow.. I hope I’ll get there, sometime. Have a lovely weekend, Sandy. Best wishes to your family and friends! I can only imagine the bite that the spice adds to the chocolate cake. Delicious! Belated New Year Greetings after such a long spell of silence. Spice and chocolate is a great combination. Thanks for visiting! I wish you a great weekend! Thank you, Melissa, Great weekend to you! I call it a wicked treat! It’s very delicious, Magi. Thanks for being here and for supporting myfavouritepastime on Facebook! I’ve never tried chocolate and spices like this; I need to sort that out and soon. That cake looks indecently gorgeous, Liz!!! Ha ha I share the same sentiments. I would never swagger around in a tee-shirt at 44F. I had my snuggly hoodie on.Thanks for complimenting the cake. You’re a great baker and so that means a lot. Have a great weekend! Oh Liz! Chocolate and spice??? So wonderful. I love your baking, you know that, right? This cake has my name all over it! Thanks for liking my baking. I feel very honoured. That cake is a great cake! Thanks have a pleasant week! Chocolate and spice is a great combo. Thanks for complimenting!